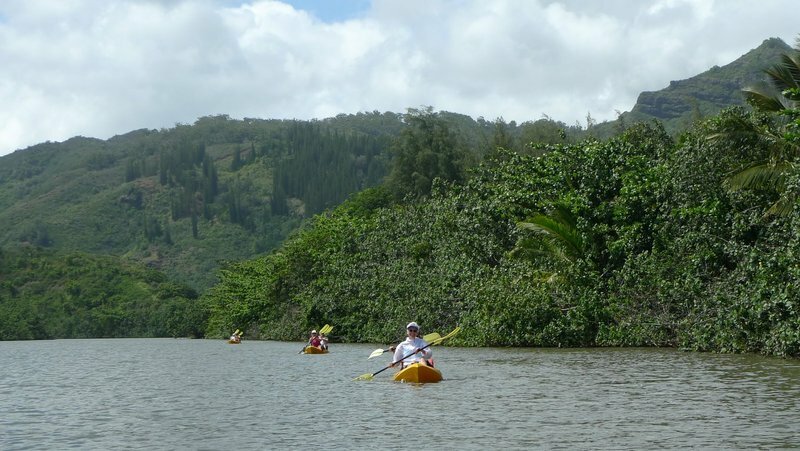 The morning after Kari and Nathan’s wedding, we piled into our vehicles and drove to the east side of the island in order to kayak on the Wailua River, Kauai’s only navigable river. 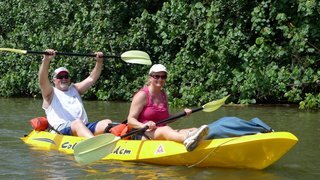 I’ve never been kayaking before, although I’ve long thought it would be a fun way to explore the water. This relatively easy half-day excursion proved to be every bit as enjoyable as I expected. After a brief orientation, we were transferred to the launch site by van. 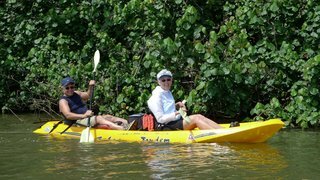 We paired up and started paddling upriver, the wind to our back. The paddling itself takes only a minor amount of coordination. The challenge is to ensure your paddling is complementary, if not perfectly matched to, the paddling of your partner. We headed about 45 minutes upstream, approximately two miles. From our perspective on the river, we were in the middle of the wild. Looking at the area on a map afterward, I realized that roads and “civilization” was actually just out of sight beyond the ridge line. 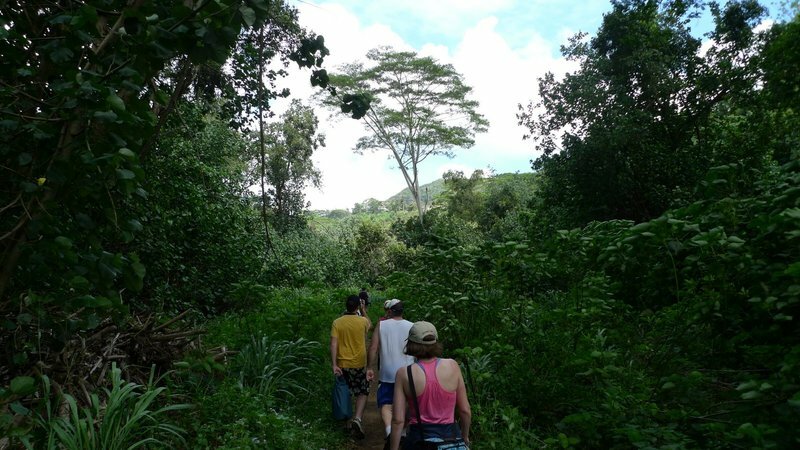 After coming to shore in a small tributary of the larger river, we began a one-mile hike through the jungle. Again, while it looked like we were in the middle of nowhere, of course we were actually on a well-worn path. 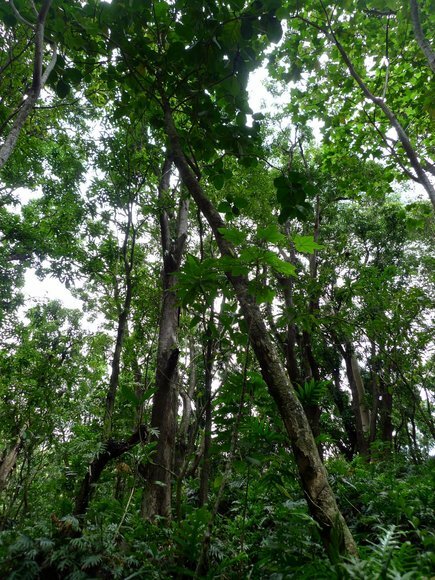 Severe jungle… holy houseplants, Batman! At one point, the path crosses a twist in the river and we have to use a guide rope to get across the water. The water at this point is only knee-high and not running that rapidly. One could easily imagine a scenario, though, where the crossing could be more difficult. On our return, my uncle was filming us and trying to encourage one of us to fake a fall into the water for dramatic purposes. 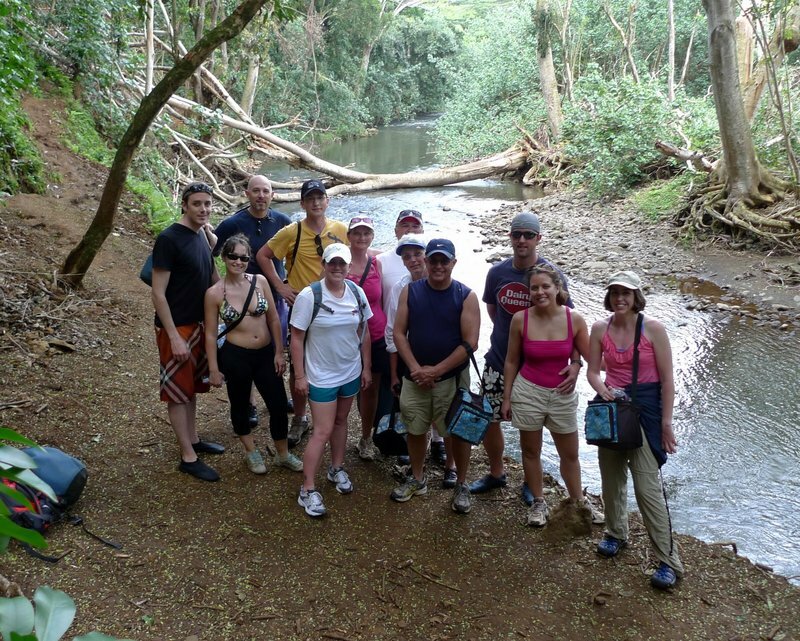 Our group, all relatives of Kari and Nathan, posing by the river about half-way into our hike. 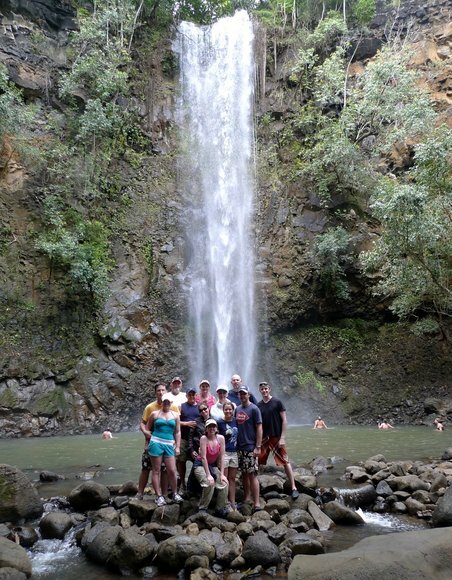 Our destination, after about a 45-minute hike, was Uluwehi Falls (“Secret Falls”), a 130-foot waterfall that has a very nice pool at its base. We sat on the rocks around the falls and ate our lunch, which we had packed in. Various other groups came and went and there were a few dozen people at the pool most of the time we were there. It is a bit hard to see in the picture above, but see if you can make out the small bowl of flower set next to the rocks, near the bottom of the photo about one-third of the way from the lower right corner. 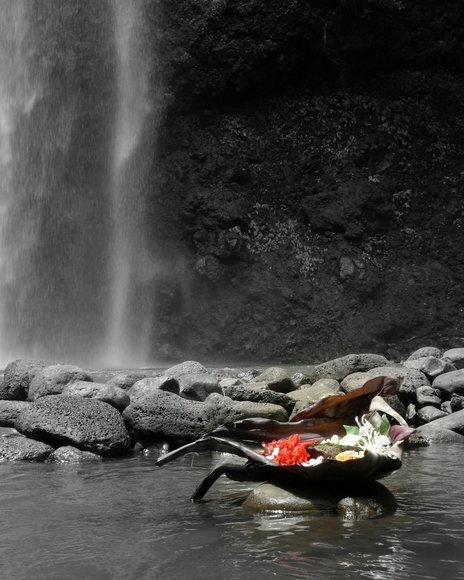 The Wailua River was/is considered a very sacred river and in this pool next to the falls there is a fresh arrangement of flowers that appears to be some sort of offering. After lunch our group poses at the base of the falls. Some members of the group went in for a swim, although I didn’t. The wide, meandering river. We were well ahead of the pack. Of course this wasn’t a competition. Right? The trip back was more challenging because the wind blows off the coast and up the river. When returning, we are paddling into the wind. The guide pointed out that if we stayed to the far left (north) of the river, we were mostly sheltered from the wind and the going would be easier. Kayaking relatives finally make it back to the launch point. Since my cousin Kelly and I arrived first, I pulled my camera from the dry bag and took pictures of everyone else as they arrived. The newlyweds were the last to make it back. My cousin Kelly and me, first upriver and first back. The secret? 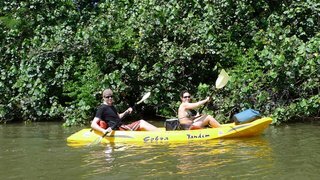 We were the only unmarried couple paddling! 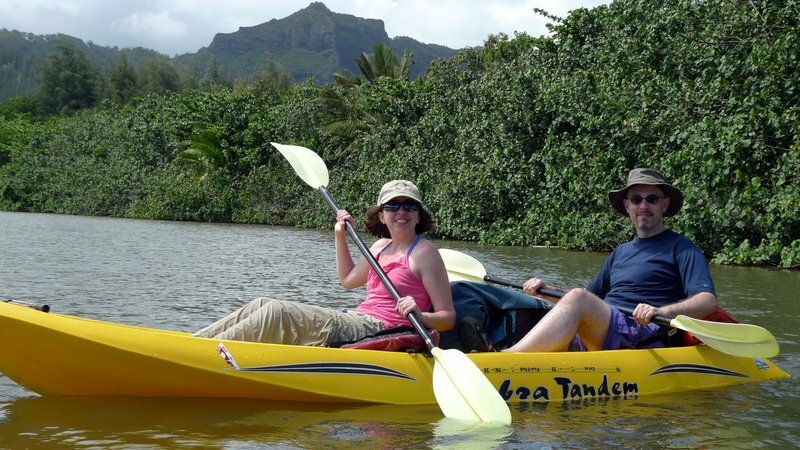 Seriously, when we were going through the orientation, the guide warned us about the nickname for kayaks – “divorce boats” – because couples can get into all sorts of disagreements, usually caused by the wounded ego of the stronger paddler (usually the man) in the back. 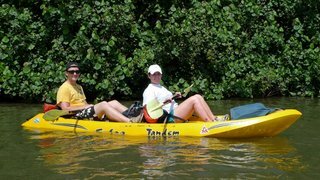 Since Kelly and I aren’t married, there was no ego involved, nothing to prove, so we just focused on paddling. I let her set the pace and tried to match her. Since she’s in the Navy, I figure she should be the expert at something boat-related, right? Afterward, we stopped in the nearby town of Kapa’a, a neat place that I wish I would have had more time to explore, for some shave ice at Ono Shave Ice. Shave ice – not shaved ice – is this great treat that can also involve ice cream and various toppings in addition to the ice and syrups. We had some very good shave ice while there but I can say that it is a dessert I don’t need to have all the time. Quite sweet. This entry was posted in Uncategorized and tagged Falls, Hawaii, Kauai, Kayak, Kayaking, River, Uluwehi, Wailua, Waterfall by christao408. Bookmark the permalink. This seems like a lot of fun! I’ve gone white water rafting… but never kayaking. So fun and scenic! Seeing the wonderful waterfall, just want to jump right into that! 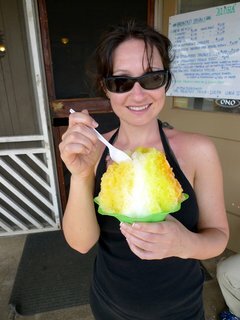 And the shave ice looks so delicious and cool! 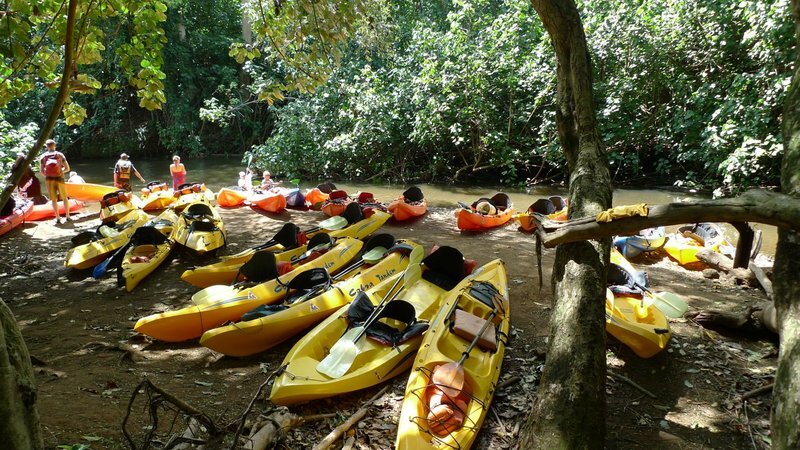 I’ve done this same kayaking tour, and it was one of the best experiences I’ve had anywhere. Ooh — that looks like a fun trip! 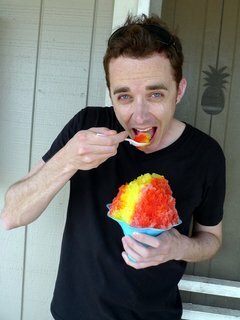 Nothing like shave ice — I have a sweet tooth, but it’s too sweet for me! looks like a fun adventure! 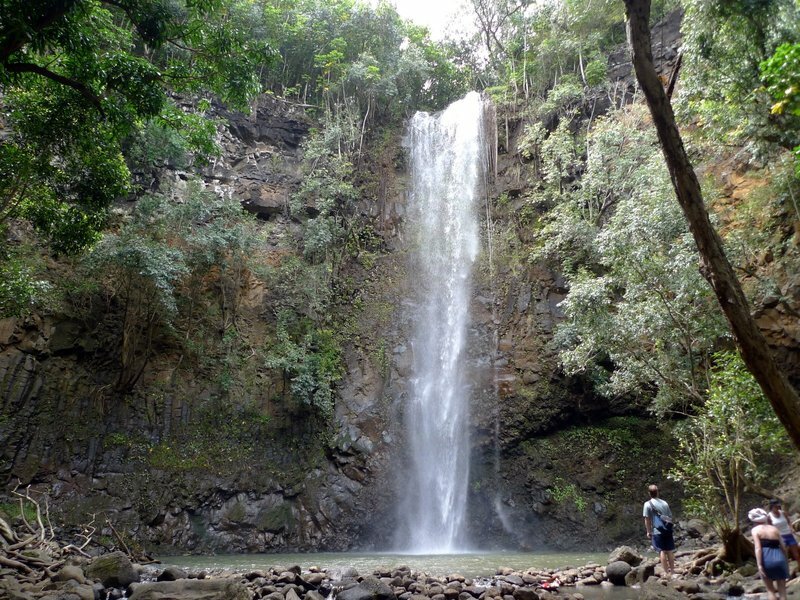 i miss hiking in hawaii; there are some great trails all over the place, offering views of waterfalls like you saw to soaring panoramas of the entire island. 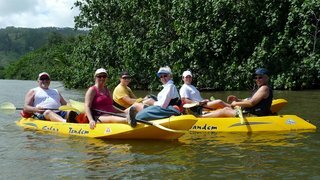 kayaking is also fun, although i haven’t do very much of that, due to the need for equipment!shave ice is good; i like it plain, and sometimes get it with azuki beans (red beans) or ice cream. i think adding the condensed milk makes it a way too sweet. oh my lord. that black and white picture with the accentuated colors… just… no words to describe it.on another note, THAT LOOKED LIKE SO MUCH FUN!!!! @Dezinerdreams – I’ve done white water rafting once, too, and really enjoyed it. Kayaking is a lot lower-key, though. 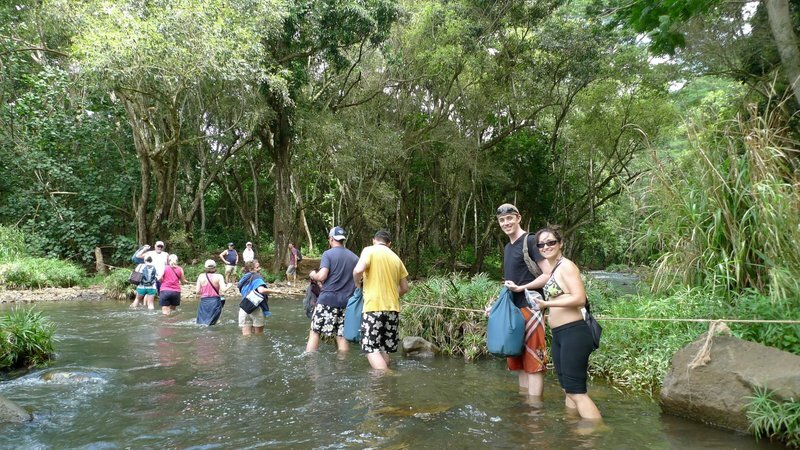 @CurryPuffy – The water was surprisingly cold for being on a tropical island! 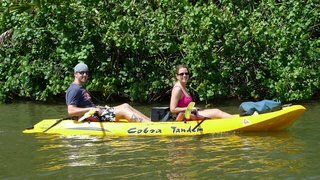 @M_1 – I would definitely recommend it as a great way to see the island in a lower key way. @yang1815 – It was. Perhaps we can find something like it on Maui? @slmret – @kunhuo42 – “Too sweet” is definitely a risk when eating shave ice. I had it with the azuki (red beans) and also mochi, to give it a little more substance. @oxyGENE_08 – It sure was! @bengozen – Glad you liked that photo, Ben. I didn’t do a very good job of masking the color area, but that’s all I had time for. @murisopsis – For Tawn, it is more the issue of sun rather than water. We each have our elements, I guess. i love it!!! that looks like a great ‘family trip’ and a lot of fun, im so jealous!! @christao408 – I would think so. We shall see!